ACKNOWLEDGMENTS Written by Jacqueline Boyd of The Care Plan (the-care-plan.com) Edited by Alex Kent Reviewed by Deborah Dunn, Kim L. Hunt, Tim R. Johnston, Stephen Kent, Hilary Meyer, Sherrill Wayland and Terri Worman The production of this guide was generously supported by the Harry and Jeanette Weinberg Foundation. Â© SAGE, 2017. All Rights Reserved. A NOTE ON TERMINOLOGY The acronym LGBT in this guide represents a full variety of gender identities and sexual orientations. Queer, questioning, gender expansive, intersex, non-binary individuals and more are included in our understanding of LGBT communities. others to care for you, but it is our hope that the tips and processes laid out in this guide will make it possible for you to do just that. LGBT people have an opportunity to think creatively about health and wellness. Whether you’re undergoing surgery to affirm your gender, replace your knee or begin cancer treatment, you will need assistance afterward, and planning ahead will help your recovery go more smoothly. The tools and resources in this guide can help you to put a care plan in place that meets your needs, in order to give yourself the best chance of a full and successful recovery. CARE TEAM: The friends, family and acquaintances who actively participate in the care of an individual. Often the care team coordinates to address post-procedure needs such as meal preparation, medication reminders, housekeeping, transportation, and companionship. QUESTIONS TO ASK YOUR DOCTOR Here are some questions you may wish to ask the specialist during the initial consultation: ¨¨ How many times has the specialist performed this procedure? How many of these procedures do they complete each year? ¨¨ How is “success” defined for this procedure, and what is the overall success rate? What is the specialist’s success rate? ¨¨ Can you see examples of their work? (This is not always relevant, but is critical to many people if the effects of surgery will be visible, such as scarring.) ¨¨ What hospital or facility would the procedure take place in? ¨¨ Are there reasons not to do the procedure? ¨¨ What are the risks associated with the procedure? ¨¨ What other options might there be to resolve the issue (less invasive procedures or alternate forms of treatment)? ¨¨ What is their knowledge about the course of healing after the procedure? ¨¨ What should you do to improve chances of a successful recovery? to you. Verify what you learn with someone from your medical team before using the information to make decisions. If you are feeling uneasy about the procedure or uncomfortable with the specialist, consider seeking a second opinion. Each medical provider is unique in their level of experience and training. In sparsely populated areas there may only be one or two options, but in more densely populated areas there could be hundreds of providers available. If you feel uncomfortable, consider seeking a second opinion. It is important that you feel comfortable with your medical team, so it may be worth the time to find medical providers who are LGBTaffirming. For information and tips on finding LGBT-affirming providers, see page 10.
numbers vary widely and can give you a general sense of the specialistâ&#x20AC;&#x2122;s comfort level and proficiency. Ask if the surgeon follows WPATH standards (see below), and if the hospital staff and eventual rehabilitation center have been prepared or trained to work with transgender patients. Other common concerns are location, length of time in the hospital and clarity on billing and insurance coverage. For more information about gender affirming surgeries, see the publications listed under Resources. STANDARDS OF CARE The World Professional Association for Transgender Health (WPATH) is a nonprofit organization that establishes internationally accepted Standards of Care for the treatment of transgender people, including gender affirming surgeries. You can find lists of registered providers and other resources on their website, WPATH.org. Medical Preparation Once you have decided to undergo the procedure, you will typically be required to complete tests to make sure that you are medically ready for the procedure. This process is critical to ensuring that you do not have any underlying conditions that may affect the outcome of the procedure. Office staff can be helpful in providing an additional perspective on the procedure. Ask to speak with the registered nurse (RN) or care coordinator. Because the specialist splits their time between surgery and the office, the RN often fields calls from patients with questions and concerns. They can offer practical tips and advise you on what the procedure and recovery will be like. If you have insurance, your insurance carrier should also be consulted to ensure that the costs of the procedure and specialist will be covered. If you are concerned about paying your portion of the cost, consider speaking with your insurance company and the billing department at the facility. Many hospitals are structured as non-profits and are able to offer subsidies, vouchers, or other adjustments to minimize your out-ofpocket costs. quickly and it may be difficult to retain all of the information the surgeon is sharing. Throughout the process, make sure you understand what the doctors are saying— it’s okay to ask them to slow down or repeat themselves. If possible, bring someone from your care team with you to these appointments to help you ask questions and take notes. life can relieve stress and calm fears. If you are facing an ongoing medical process, or something that is emotionally difficult for you, consider entering into counseling or finding a support group. FINDING SUPPORT If you need support, consider reaching out to LGBT-welcoming groups and organizations. LGBT organizations have resources gleaned from their work supporting people in the local area. Some hospitals and community-based health care providers have LGBT support groups and advocates within their system. 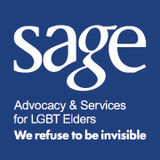 SAGE affiliate offices and the SAGE LGBT Elder Hotline (1-888-234SAGE) are available to provide peer support and additional resources— see the Resources section for more information. Importantly, most versions of the CARE Act have no stipulations about who may be named as the caregiver, which means you can name a friend or chosen family member and that person should be recognized by the hospital as your caregiver. Before you go in for a procedure, give some thought to who you will name as your caregiver, and talk with that person about what this means. Contact your local AARP office for more detailed information about the CARE Act in your state. through the discharge instructions and understands them thoroughly. Don’t hesitate to ask questions or to request more instruction on how to do something that will be needed at home. Post-Procedure Following the procedure, you may not feel like yourself for quite a while. It can take weeks or months to heal, and for some procedures even a year or more. The medical team will advise you on what to expect during your recovery. Pain, fatigue, lack of appetite, lack of thirst, dizziness, and swelling are common immediate effects of many procedures. The medical team will probably provide you with prescriptions to offset some of these effects, but experiences vary by individual. •• Food/fluid intake •• Drainage/wound care •• Medications taken •• Vital signs •• Bruising/swelling/redness Listen to your body and if something doesn’t feel or look right to you, you or a member of your care team should contact the medical team. There will be follow-up appointments which are not to be missed. These appointments are the specialist’s opportunity to check on your healing process, make any adjustments to your care plan and answer questions that may have come up. Listen to your body, and contact your medical team if you have any concerns. Your care team is a crucial component of your healing. You may not feel up to having visitors, but you will need some direct care and may need help with tasks like showering, cooking, and cleaning. Be honest with your team about when you are interested in conversation and being active. It is normal to be a bit irritable at times following surgery. If you are in a hospital or rehabilitation center, nurses and other staff will be on hand to monitor your progress and assist you with most tasks. It is still a good idea to have a member of your care team with you, for reasons outlined in the next section. If you will be recovering at home, you are likely to need additional assistance, and you may be eligible for home care and other services; those specific resources will also be discussed in the next section. If you do not feel that you have enough care in place to recover safely at home, talk to your doctor and the hospital discharge planner about your options. Living alone may be reason enough to qualify for extra services or time at a rehabilitation center. If you are not comfortable returning home immediately after the procedure or hospitalization, speak with your doctor to determine whether your aftercare can include full-time home care or admission to a rehabilitation center. •• Reach out to your local HIV/AIDS service providers, who often have close connections to LGBTaffirming home care agencies and other services. •• The best references come from the people you already know and trust. Ask friends with similar circumstances who they have used, and whether they felt respected and comfortable. •• Ask whether the provider or the agency’s staff have been trained on how to provide culturally competent care to LGBT people. •• Look to see if there are providers who advertise in your local LGBT newspapers and magazines (either print or online) or have signed up as sponsors, members, or partners with local LGBT groups. •• Ask providers directly if they serve LGBT individuals, and if so, find out whether that’s concrete (current or past clients) or hypothetical (“we welcome everyone”). •• Most providers have nondiscrimination policies—check to see if these policies specifically include sexual orientation and gender identity, and whether they post or distribute their policies openly. You can also ask how those policies are enforced. •• Most importantly, always trust your instincts! Only you and your loved ones know what’s right for you. Create Your Care Plan A care plan is a tool for managing your care. In general, a good care plan captures the details of the procedure (including providers, location, medical team, and plans for recovery), any relevant health history and medical information, a list of identified care team members, and a list or chart of tasks to be completed, including how, when, and by whom. There are 3 basic steps to building and using a comprehensive care plan: 1. Identify Your Needs 2. Confirm Your Care Team 3. Implement the Plan The next sections will walk you through each of these steps, utilizing the worksheets provided at the end of this guide. allows you to set aside worries about who will accomplish these tasks, and focus on what will have the greatest impact on your health. Many of the most common needs to consider are listed below: 1. Advocacy at appointments and during the procedure: Your advocate ensures your needs are met, helps to facilitate clear communication, and can intervene if anything inappropriate occurs during your stay. Having a trusted support person by your side provides moral support and ensures consistent communication with the medical team. It is also helpful to have someone with you whenever you speak to the doctor at appointments and in the hospital, to take notes and be sure you understand everything being said. 2. Equipment pick up or installation: If there are pieces of equipment that need to be picked up for your use, try to arrange for that before the procedure. Basic equipment can be installed by your care team; medical devices or machines may need to be brought to the home and installed by a professional. medications, remind you to take them, sort them into pill organizers, change patches and more. 10. Grocery shopping and meal preparation: Proper nutrition is important to your healing, and members of your support team may be able to contribute meals and grocery shopping services throughout the course of your recovery. A website like mealtrain.com can be helpful for setting up a schedule of meal deliveries. Be sure to communicate any dietary restrictions set by your medical team. 11. Wound care/drains: Wound care should be completed or monitored by a nurse whenever possible, however you may be in a situation where nursing services arenâ&#x20AC;&#x2122;t available. Before you are discharged, a care team member should be trained by the medical team on the process of changing the wound dressing or emptying drains, including frequency, supplies, and what to look for. It is important to know how much drainage is normal and what the appearance should be. 12. Monitoring basic health: During your follow-up appointments the medical team will need to know certain pieces of information to assess your healing. Your care team can help to log and monitor things like your pain level, food and fluid intake, medications taken, and any bruising, swelling or redness. 14. Bill pay: Prolonged physical or cognitive impairment from procedures and some treatment may mean you will need assistance with paying bills. You may be able to set up automatic payments through your bank but if this is not your preference or not an option, ask a trusted member of your care team to help. 13. Exercises: Post-procedure recommendations may include some type of therapy or exercises. A member of your care team can assist with consistent completion of exercises to enhance your recovery. are sleepy or woozy from medication, it may be difficult to understand what they say, so having someone there to handle those communications can be important. Your care team member can also keep track of which medications you’ve had and when, what you are allowed to eat, and other details that may be difficult to remember. They can advocate for you if you want to speak to the doctor, feel you need more medication, or otherwise aren’t getting your needs met. If your rehabilitation and recovery is taking place in a facility, it will likely be a skilled care facility with nurses and other staff available around the clock. These people will change shifts two or three times per day and it will take a few days for them to get to know you and the extent of your needs. If a care team member is available to be with you in the facility for the first 24 hours, that will help the staff orient to your needs and help you orient to the new location. Having a care team member there to advocate for you can also help to get your needs met more quickly. Build a Schedule Part of identifying needs is identifying when you will need support. Build a tentative schedule so you can speak confidently with people about what you need and when. A timeline is very helpful for people to “plug in” easily to your care plan. See the Comprehensive Care Plan worksheet on pages 26–32 for additional details. Your medical team can share recommendations for how long you should plan to have support. The more complex the procedure, the longer you will likely need someone with you. It is better to have more care and be able to send people home than to not have help when you are not feeling well. You may be operating at less than your usual capacity leading up to the procedure date. Notes or documentation on a calendar are good ways to stay organized while developing your care plan. Keeping detailed notes will also help you feel more in control and at the helm of the process. If the task of putting together the care plan seems overwhelming, consider asking a member of your potential care team to help you with it. A LEGACY OF CARING The early part of the AIDS epidemic in the 1980s found members of the LGBT community stepping up to care for friends, loved ones and even strangers who needed care and support but had no one to rely on. This legacy of caregiving has uniquely prepared LGBT older adults to care for one another as they age. When someone needs assistance, the community is often able and willing to rally around them to provide it. closest to, your family of choice. Support within your networks may also come from friends, co-workers, neighbors, and community members. If you have been involved with a volunteer organization, spiritual group, gym, senior center, book club etc. and made connections, consider reaching out to those people. You may be surprised how eager people are to show up and help out. Finally, local LGBT community centers or advocacy organizations may be able to help find volunteers to be a part of your care team. Realize that in the same way you want to help the people you care about, they probably want to do the same for you. Everyone needs help at one point or another, and including people in this process can bring you closer together. want to do the same for you. Everyone needs help at one point or another, and including people in this process can actually bring you closer to them. You may rely on your family of choice for many things, but these people may not always know their place in your care, and so making a point to clearly request their involvement is very important. When a procedure or illness is on the horizon, members of your family of choice may be concerned about overstepping their bounds. They may be ready to show up, but not know for sure whether you would welcome their involvement. friend who is a pet lover, asking them to walk the dog is a natural fit. Some people love to go grocery shopping and run errands; others may prefer to sit home and keep you company. If you have a friend who has worked as a nurse, health aide, etc. they may be best suited to helping you in the hospital or assisting with personal care. If you have someone coming from out of town to help, it is generally best for them to be there immediately before, during, and after the procedure. Your relationship to each person is important as well. If you want to have specific people visit during your recovery, it serves you to let them know. If there are people you would rather not spend a lot of time with while you’re recovering, you can ask them to help with tasks that involve less interaction. Your healing will proceed most smoothly when you are around the people who you find pleasant and helpful. Remember to document the various people who are involved in your care along with their roles and contact information. This will contribute to a sense of cooperation and ensure that nothing slips through the cracks. Use the list on pages 12–14 to identify areas where people can volunteer or contribute. It’s always better to have too much care coverage rather than too little. It is easier to cancel someone than to get help on short notice. Try to plan ahead and schedule care for times when you will need the most support. For example, if you wake up at 10am every morning, bathe, take medications, get dressed, prepare breakfast, and exercise, schedule someone to be with you for that 2–3 hour period every day. You may feel more comfortable asking if you can do something in return. This is not a requirement for asking for help, but it may be something you want to offer for your own peace of mind. See the box at left for some ideas. If you are willing to participate in someone’s care in the future, make that known as well. If you have a limited support system, you may be asking 1 or 2 people to spend a lot of time or energy. Prioritize your needs and secure care team members for the most important things first. If you are not able to meet all of your needs, consider engaging professional services to fill the gaps. Professional Services In many cases, your informal network will only be part of the solution and one or more professional service providers will be brought in as well. Some services will be free or covered by insurance benefits, while others may come at a cost. To find your local Area Agency on Aging, contact the ElderCare Locater National Call Center at 800-677-1116 or eldercare.gov. •• Physical, Occupational, and Speech Therapists* •• LGBT advocates within the hospital system •• Services through the Department of Veterans Affairs (VA) *Typically covered by insurance benefits Your surgeon may recommend professional services but is often limited by liability from making a specific referral. The discharge planner at the hospital or your specialist’s office typically will provide you with lists of resources to investigate, then can coordinate details once you have chosen a provider. If you know you are likely to need certain services, it may be helpful to research them in advance. You’ll find some tips for choosing service providers to the left and on the next page. It is best to have two or three choices prepared in case a service is unavailable or a facility is full. There may be other free or discounted services available in your area to supplement care. Your local Area Agency on Aging can refer you to services such as home delivered meals, transportation, case management, minor home repair, and benefits review. Your insurance company, health care provider or local LGBT center may also have care coordinators in place to help. CHOOSING QUALITY SERVICE PROVIDERS Check with your State Department on Aging or eldercare.gov: ¨¨ Is the provider properly licensed in your state? ¨¨ What overall ratings has the provider received? ¨¨ Are there any complaints registered against the provider? When identifying whether a care task is best completed by a member of your informal network or a professional service provider, consider these three questions: 1. Does the task require specific training? 2. How much time will it take? 3. What will be the impact to your health if something goes awry? For example, if you require wound care, there may be a wound care nurse who will come to clean and dress the wound a few days each week. That person is trained to monitor the critical aspects of your healing and is part of a system of professional services at your disposal. If you are having an outpatient procedure and you will need someone to pick up prescriptions or groceries and walk your dog, those tasks can be completed by someone in your informal network. Special Topic: Advance Directives Advance directives are a set of legal documents that provide detailed instruction on your wishes. Procedures and surgeries provide an opportunity to consider putting some of these important documents in place, and some institutions will even require it. Advance directives are fundamentally about empowering you to manage your care and property throughout life. They allow you to make your wishes clear in case you are unable to communicate them. Without advance directives, medical decisions may be left to the medical team or to your legal “next of kin,” which means your parent or sibling might be given decision-making power rather than your best friend or partner. Lack of direction can cause discord within your care team, or result in medical decisions being made that you would not have wanted. Clear advance guidance ensures that your wishes are respected, and also empowers your decision-makers to feel confident about the choices they make. discussion on choosing your power of attorney. •• Living Will or 5 Wishes document — Records your own wishes for medical care, such as which methods of lifesustaining treatment you would want if they were needed. This document can be used in conjunction with a power of attorney to guide decisionmaking, or can stand alone •• Hospital Visitation Authorization Form — Dictates who you do and/or do not want to visit you in the hospital. See the discussion on page 14. •• HIPAA Waiver — Allows someone to access your medical information, and enables doctors to speak with them in detail about your care. •• Financial Power of Attorney — Enables someone to make financial transactions on your behalf. This can be set up to take effect only if you are incapacitated. It is strongly recommended that you seek legal assistance before completing this document. •• Will (sometimes called Last Will and Testament) — Dictates how your assets should be distributed upon your death. It is recommended that you consult a lawyer for help writing a will but you can create a simple one for free at willing.com. friend. Be certain to take some time to carefully consider who in your life is best suited for this critical role. It is important to communicate with the people you’ve identified as your POA and successor POA so they are aware and agree to the responsibility. They should have copies of the documentation for when the need arises, and your doctor and/or hospital should have copies in their files as well. ADDITIONAL RESOURCES Advance directive forms vary from state to state and may require signatures from a doctor, notary public, attorney or other witnesses. State-specific forms and instructions can be obtained from your state health department or local Area Agency on Aging, or at the following websites: •• AARP: aarp.org/advancedirectives •• National Hospice and Palliative Care Organization: caringinfo.org/advancedirectives •• National Healthcare Decisions Day: nhdd.org/state-specific-resources •• Five Wishes: agingwithdignity.org See the End of Life Decisions section of the National Resource Center on LGBT Aging (lgbtagingcenter.org) for additional resources on advance directives. This third step brings all the tasks, care team members and medical details together in one central location. In creating a care plan, you have drafted a document to keep your team connected and yourself organized. As you approach your procedure, it is time to put your care plan into action. Communication with the care team, medical providers and other parties is very important. Focus on being clear and concise with all communications. Check in with your care team in the weeks and days prior to the procedure, and ensure that everyone is clear on their roles and that any questions have been answered. Review your plan as well to make adjustments and updates if necessary. It is a good idea to call everyone the day before the procedure to reconfirm. This type of coordination is something a care team member can do for you if you have enough support. DOCUMENTATION Documenting your condition, needs, care team members, etc. can save you time and energy. Explaining your condition over and over, connecting with friends and family, and coordinating details can be draining. A care plan can function as an informational document for your medical and care teams and as a reference document for you. There is no one way to create a care plan, so make something that fits your needs. The worksheets included in this guide are meant to serve as examples and tools. If the format doesn’t make sense to you, other options might be to use a notebook, a computer program or a notetaking app. The information should be in one place and easily accessible to care team members. days after returning home. It is important for your care team to have the medical providers’ contact information as well. These details will be critical if there are complications or questions, or if general follow-up communication is needed. CONGRATULATIONS! By taking the initiative to make a care plan, you have prioritized your health and recovery. Facing a procedure and the changing needs that come with it can feel overwhelming. In identifying your needs, building a care team, and documenting a care plan, you have taken important steps to be in control of your health. 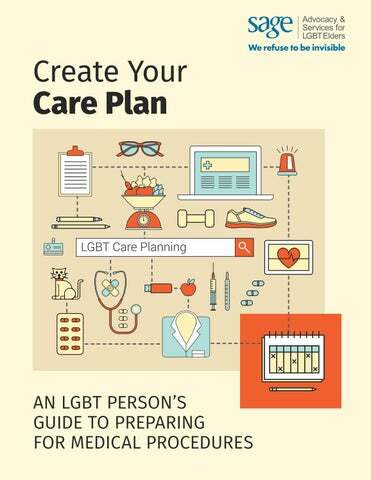 Download additional copies of this worksheet at lgbtagingcenter.org/careplanning. Remember to keep in mind the various tasks you may require support to complete safely. Think about including transportation, meal preparation, medication pick-up and reminders, personal care tasks, pet care, companionship and other areas outlined in the guide. Glossary Advance Directives: Set of legal documents which identify decision-makers for health and financial considerations. Advance directives can include a Living Will, Power of Attorney, and DNR forms. These documents direct family, friends and medical staff about a person’s end-of-life wishes if they lack the ability to make or communicate decisions. Area Agency on Aging (AAA): Local agencies created under the Older Americans Act to oversee and manage a wide variety of programs and services for older adults. Care Team: The friends, family and acquaintances who actively participate in the care of an individual. Often the care team coordinates to address post-procedure needs such as meal preparation, medication reminders, housekeeping, transportation, and companionship. Discharge Planner: Typically a social worker or nurse case manager who coordinates discharge from the hospital. Responsible for providing care options and setting up a plan for post-procedure support. DNR (Do Not Resuscitate order): Provides instruction on cardiopulmonary resuscitation and life support in case of emergency. Utilized frequently in hospital or long term care settings to ensure a patient’s wishes are clarified and respected. Family of Choice: Diverse family structures and support networks that include but are not limited to life partners, close friends, and other loved ones not biologically related or legally recognized but who are the source of social, emotional and caregiving support. Geriatric Care Manager: A health and human services specialist who acts as a guide and advocate for families who are caring for older relatives or disabled adults. They are educated and experienced in any of several fields including nursing, gerontology, social work, or psychology, with a specialized focus on issues related to aging and elder care. Gender Affirming Surgery: Surgical procedures that change one’s body to conform to one’s gender identity. Sometimes referred to as “gender reassignment surgery” or “gender confirming surgery.” HIPAA: Health Insurance Portability and Accountability Act which protects medical records and health information. Home Health: Short-term health care services that can be provided in a patient’s home for recovery from a procedure, illness or injury. Hospice: Medical care provided in a person’s home or an inpatient unit to provide comfort during the end-of-life process. Inpatient: Medical care that requires formal admission to a hospital. For inpatient surgical procedures, you will stay in the hospital overnight after the procedure, and possibly longer. Outpatient: Medical care that does not require hospital admission. For outpatient surgical procedures, you will leave the hospital (or specialist’s office) the same day. Palliative Care: Specialized medical care for people with chronic or serious illnesses. The approach focuses on symptom management and comfort. Physician’s Assistant: A nationally certified and statelicensed medical professional who works within healthcare teams. Primary Care Physician (PCP): The medical professional at the center of a person’s care. A PCP is knowledgeable about many common health conditions and can provide advice and referrals when necessary. Typically a doctor, but could also be a nurse practitioner. Rehabilitation Center: A licensed healthcare residence that provides continued care for those who are medically stable but still need significant assistance, and offers various therapies aimed at restoring functional ability and quality of life. Residents/Fellows: Doctors who have completed medical school, and are gaining additional skills in a specialized field. Often a resident or fellow will interact with you directly, and report back to the specialist. Specialist: Doctor who has extensively studied a particular area of medicine. In this guide ‘specialist’ may refer to a surgeon or the professional completing the planned procedure. Vital Signs: Measurement of a person’s temperature, pulse, blood pressure and respiratory rate. Indicates proper and improper body system functioning.